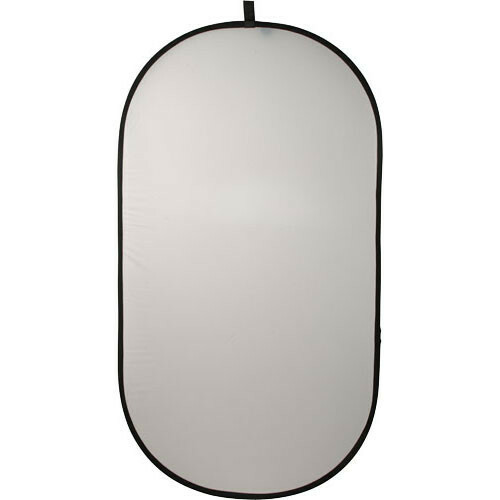 Impact Collapsible Oval Reflector Disc - White Translucent - 41x74"
This Impact Collapsible Circular Reflector Disc is a versatile lighting tool for in the field and in the studio. It allows you to bring out the shadow detail in your subject, using available or studio lighting. The disc's translucent surface softens direct or harsh light. This 41 x 74" oval disc is suitable for full-length portraits and large still-life setups. It folds down to 1/3 its open size, and comes with a storage sleeve. We suggest the purchase of a pivoting arm and stand, to hold the disc where needed -- especially if you are working without an assistant. Translucent white produces a soft light that works beautifully for both product shots and indoor/outdoor portraits. Box Dimensions (LxWxH) 23.0 x 22.0 x 1.5"
Collapsible Oval Reflector Disc - White Translucent - 41x74" is rated 4.6 out of 5 by 5. Rated 4 out of 5 by Michael from Also good to use as a reflector. I bought these to use as reflectors for my head shots. My models often complain about how bright standard white reflectors are so I bought these because they aren't nearly as harsh on the eyes when reflecting sun light. You have to bring them in pretty close but they work beautifully. My only complaint is they are difficult to fold up and put away. It takes practice and its hilarious to watch my assistants try to figure it out. Rated 4 out of 5 by Anonymous from Great tool for outdoor photos If you are shooting outdoor portraits a diffuser like this is a must have! Since we bought this diffuser we have used it on every single outdoor shoot without fail. Great peice of equipment! Rated 5 out of 5 by Rob from Does the job. I use this for shoots out in bright/harsh daylight to diffuse the sun. It works like a charm. It is hard for my asssitant to hold when it's breezy outside, but that so far is my only complaint. Rated 5 out of 5 by Anonymous from Collapsible Oval Reflector Disc - White Translucent - 41x74 Aunque todava no lo he utiliado, la calidad del material del disco se siente bien, tuve que practicar un poco para lograr cerrarlo. Creo que ser de mucha utilidad. Rated 5 out of 5 by Photographer from love it folds down small enough to fit in the overhead compartment for travel. good 1.5 stop diffusion. easy to clamp on or have an assitant hold overhead. This disc would reduce the light by 1 full stop.